Marc Riboud, a famous French photographer put the art of photography in a simple way saying “Taking pictures is savoring life intensely, every hundredth of a second.” Well inarguably it is true; photograph is one thing that just captures that one special moment for millions of years. I happened to ponder over wildlife photography, which I believe is far more difficult than any photography genre. Getting that perfect frame and light and that perfect look from the animal is s painstakingly difficult, however the joy of capturing the best can be immeasurable. If we talk about India, which is undeniably the hotspot of biodiversity in the world, it provides a great wildlife frame to capture. National Parks like Ranthambore offer some of the splendid grounds for Indian photo tours that intrigues not only Indian photographers but also famed and awarded foreign wildlife photographers. 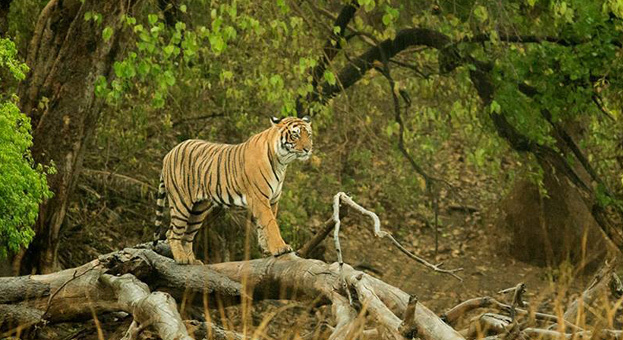 If you have the thing for photography and wildlife, then you must take a photography tour to Ranthambore National Park. Brilliant wildlife on display with gorgeous landscape and lights to capture some of the best wildlife photos in India, Ranthambore invites both amateur and professional photographers to have an experience of lifetime. 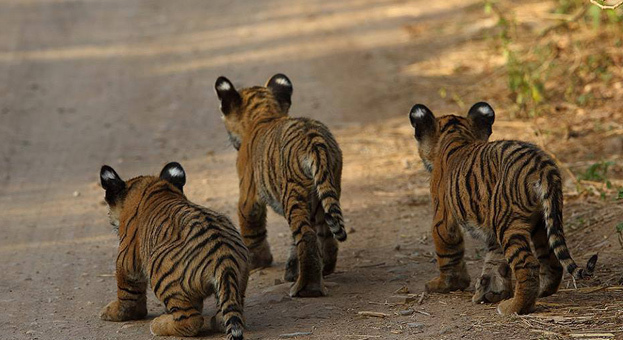 For obvious reasons wildlife steals the limelight in Ranthambore National Park. Animals like Leopards, Striped Hyenas, Sambar deer, Chital, Nilgai, Common or Hanuman langurs, Macaques, Jackals, Jungle cats, Caracals, Sloth bears, Black bucks, Fivestriped Palm Squirels, Indian False Vampires, Indian Flying Foxes, Indian Foxes, Indian Gerbilles, Rufoustailed Hare, Indian Wild Boar, Chinkara, Ganga Soft Shelled Turtles, Indian Pythons, North Indian Flap Shelled Turtles, Rat Snakes, Russel's Vipers, Common Palm Civets or Toddy cat, Coomon Yellow Bats, Desert Cats, Indian Mole Rats, Indian Porcupines, Longeared Hedgehogs, Ratels, Small Indian Mongoose, Snub Nosed Marsh Crocodiles, Desert Monitor Lizards, Tortoise, Banded Kraits, Cobras, Common Kraits, Saw-scaled Vipers and birds like Peacock, Eagle, Owl, Egret, Crane, Heron, Cormorant, Drongo, Woodpecker, Parakeet, Flycatcher, Babbler, Treepie, Kingfisher, Lapwing, Bulbul, Mynah, Patridge and the Indian Chamaeleon give enough reasons to photography enthusiasts to visit the park. With forest changing its color in every season and the ruins of the Ranthambore Fort offer a feasible background for photography in Ranthambore National Park. The tinges and tones of colour of the vivid flora and relics of the fort and undulated landscape add life to any picture taken in this national park. As wildlife enthusiast and avid photographer, I understand that Tiger is the reason that most people would want to visit any national park. 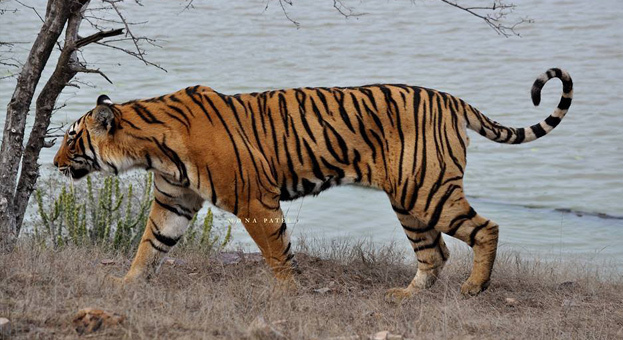 With a good population of tigers in Ranthambore National park, a wildlife photographer has better chances to capture the big cat in its natural habitat and various moods. 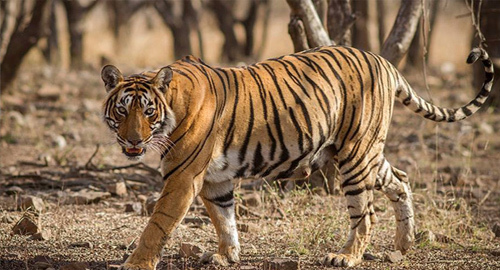 Your odds at Ranthambore are Machhli, who is a camera-friendly tigress in Ranthambore may come out to give you couple of sassy poses or the young and wild Sultan might offer few good poses while you loiter in the park. The beaded tigeress, Mala can also woo you with her definitive looks. Also, if you are planning to visit Ranthambore National Park anytime soon, you might have a good chance to click pictures of T-19 and her newborn cubs. Another great picture from the wild comes from mud-lashed crocodiles’ end, who likes to bask in the sun and give some great poses to the camera. Amongst the birds, owls are the main attraction for photographers; their large eyes and gorgeous flight are definitely worth the effort. Other birds in Ranthambore keep the national park lively and give you some of the most colourful photos to take home. Arrive Delhi, you will be welcomed by our representative and will be transferred to the hotel. Spend rest of the day relaxing and in leisure. Overnight stay in Delhi. Morning Transfer to railway station in Delhi to board train for Ranthambore (Ranthambore is one of the finest tiger reserves of India and considered the best place to spot a tiger in his own natural habitat. The park is also popular with the wildlife photographers.). On arrival, meet our representative at the station and transfer to wildlife Resort. After lunch we will be taking you for Afternoon Safari, Evening is free to relax and rejuvenate yourself. O/N stay at Wildlife Resort. Take morning and afternoon safaris to the national park to explore and click the picture of vivid flora and fauna. O/N stay at Wildlife Resort. Take morning and afternoon safaris in the national park in different zones or may be in the same ones (depending upon your choice) to click pictures and explore the rich Flora and Fauna. O/N stay at Wildlife Resort. Take morning and afternoon safari into the national park, to explore and click the pictures the rich Flora and Fauna of the Ranthambore National Park. O/N stay at Wildlife Resort. Take morning and afternoon safari into the national park, to click pictures and explore the rich Flora and Fauna of the Ranthambore National Park. O/N stay at Wildlife Resort. Take morning safari into the national park, after breakfast transfer to station; time to catch train for Delhi. On arrival meet our representative at the station and transfer to the airport time to catch flight for onward destinations. The tour packages can be customized on requests as well. So, all you have to do is pack your bag, tell what all you want to see in Ranthambore and then leave everything on the travel operator, who guarantees a fun and adventurous trip altogether. Along with the right camera, lenses and other support equipments it is important to carry an attitude while you are at Ranthambore National Park. Have an open mind without expecting too much when visiting the park as you can never be sure of what all is waiting your visit. Keeping the mind focused on something particular can make you miss out on a lot. In best of spirits enjoy this Indian photography tour and you will eventually get positive results of your positive approach.